An acquaintance had defined fresh water springs as simply, “A hole in the ground with water in it.” For some, the confining nature of a closed body of water with little aquatic life had probably fit that description. 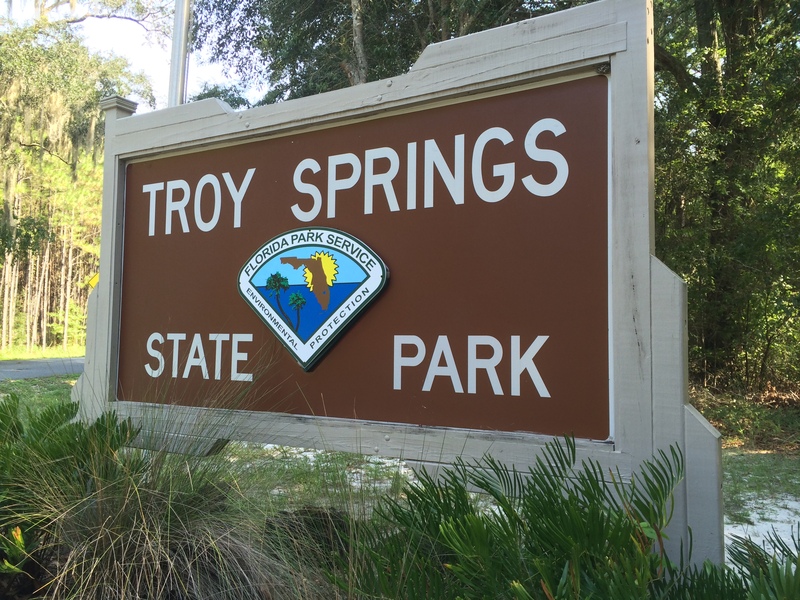 With my affinity for the crystal blue waters of Andros Island, Bahamas, that assessment was probably on point; however, questions had motivated my return to Troy Springs State Park @ Branford, Florida. Questions of unknown sights, limits, and connections had helped steer my vehicle across a three hour drive to the heart of north Florida. Upon arrival, my first question about the park being underutilized had gone out the window. A group of scuba divers had conducted training drills filling the park with chatter and foot traffic. So, my friend and I had opted to wait for the activity to clear. Patiently, I had sat on a wooden bench by the spring boil thinking of my second set of questions. What was beyond the darkness on the surface? What had concerned a dive shop owner to recommend staying clear of this descent after getting scuba certified? After cooking in the summer heat for 30 minutes, my dive buddy and I had moved into the water closing in on some answers. Reaching 70 feet, the view was unremarkable with shadow, sand, limestone, and logs. Though, one creature had stood out, a tiny brown flounder hugging the shady spring floor. To the question of avoiding this dive after getting Padi certified, there was depth and the dangerous allure of cavernous openings. The next reason for the trip was my friend demonstrating his ability to still function diving, despite a bum shoulder. This was an important benchmark before suggesting an open water dive in a cattle boat on the Atlantic. To that end, he had appeared like a playful otter flipping over in circles maintaining a consistent depth. The last question was reconnecting with fresh water springs. 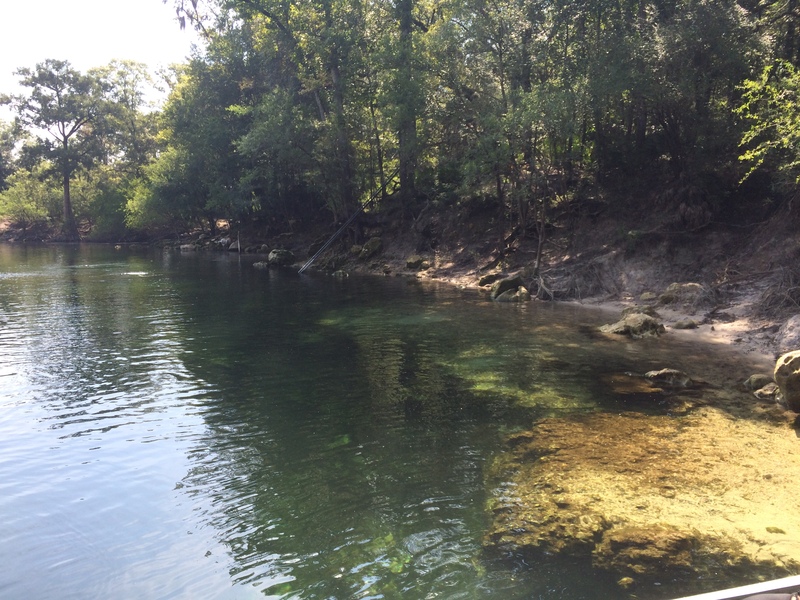 For most of the 24 minute dive, the springs had lost some of its’ luster from the previous year. My perspective had changed with an emphasis away from swimming to diving. Though, this notion soon had changed during our safety stop. Perhaps, it was the white noise of water pushing out into the spring. This noise had provided a similar experience to lounging out in amniotic fluid. For a moment, I had felt a calm floating about with my legs and my arms crossed awaiting to rise to into the summer heat. Much like the surface skimming insects, there was a reason to be here. I had only needed to slow the mind for a minute for that epiphany of grace. 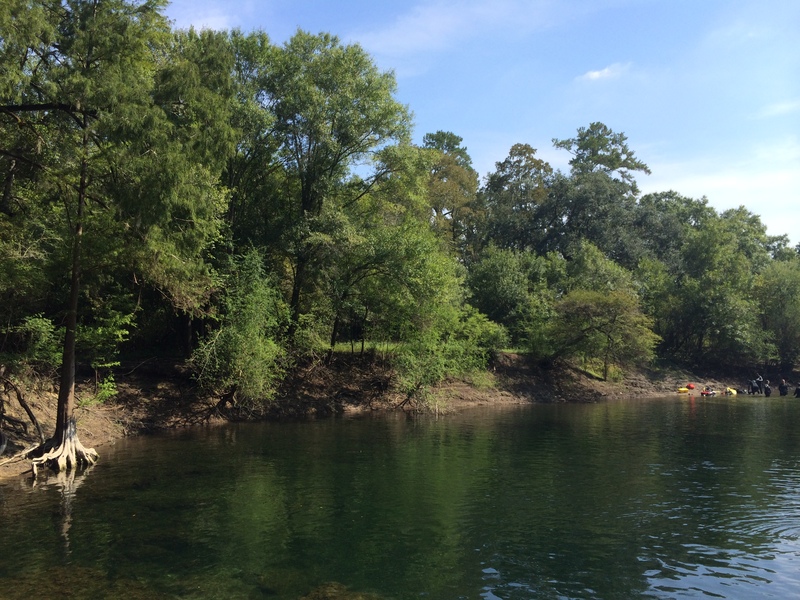 This entry was posted in North Florida and tagged Branford, diving, Florida, Florida State Parks, Fresh Water Springs, North East Florida, Swimming, Troy Springs State Park, Troy Springs State Park @ Branford. Bookmark the permalink.